AMC Stubs A-List Reviews - Best Movie Theater Subscription? 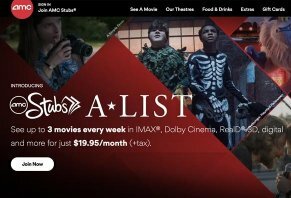 AMC Stubs A-List is one of several movie ticket subscription services on the market. It’s combination of 12 movies a month, special priority lines at the theater and bonus cash make it the top choice. AMC Stubs A-List is a movie theater subscription through which you can watch up to three movies per week for $19.95 a month. The service launched in June 2018 just as another theater subscription company, MoviePass was stumbling through a ton of issues with their service as well as rumors of their company’s funding running out. According to an AMC press release, their service was wildly popular within just a few months of launching. Along with MoviePass, A-List’s competition includes Sinemia and Cinemark Movie Club all four of these services have their own pros and cons. In this review, we’re going to analyze the rules for A-List, describe how you actually buy a ticket with the service and then discuss how the service compares to MoviePass, Sinemia and Cinemark. While rules aren’t the most interesting thing to discuss, they are vital to your experience with A-List. Theater subscription services tend to put limits on how many movies you can watch in a month or day, which types of movies you’re allowed to watch and where you have to be, physically, in order to purchase a ticket. Only A-List and Sinemia allow premium-format tickets through their subscriptions. One of the perks of A-List is that you can reserve your movie online, which we’ll talk about later. However, you’ll need to remember that you can only have three reservations at one time, even if those reservations aren’t in the same week. Also, AMC says the week starts at 6 a.m. on Friday and ends at 5:59 a.m. on Friday. So, in theory, your ticket count will reset to three every Friday morning at 6 a.m. Whereas Sinemia, Cinemark Movie Club and MoviePass require you to have a physical card to make your ticket purchases, A-List gives you a virtual card. This presents a great advantage that the other services can’t provide: instant access to movie purchases. You see, you can’t use the other services until you get your card in the mail, which can take as many as 10 business days to arrive, and, in some cases, longer. You have two options for buying tickets: online/mobile or in-person. The online and mobile options work via the AMC website and the app and you have to be logged into your A-List account in order to get the proper pricing. Basically, you scroll through the movies you want to see and pick a show time. You also choose how many tickets you want. If your movie has assigned seating, then you’ll be able to choose seats for all the tickets you’re purchasing. Once you’ve chosen your seats, you’ll be taken to a payment page where you’ll buy the ticket or tickets you wanted. You’ll notice that the app will automatically deduct the cost of your ticket from the total. Once you purchase your tickets, you can access them in the app when you arrive at the theater. You can also use your virtual card to buy tickets at the box office or a ticket kiosk. Whichever the case, you’ll have to show your ticket, your virtual card and your ID in order to get into the theater and watch your movie. In addition to getting 12 movies a month for $19.95, your A-List membership also entitles you to the benefits of the Stubs club, whose main benefit is that you earn points for every purchase you make and you’ll get $5 in cash rewards for every $50 you spend. Your A-List perks also include free movie bookings – you don’t pay a convenience fee to book online or through your app. The rules for canceling A-List are interesting. First, the fine print says that you have to pay for at least three months of the service before you can cancel it. Second, if you cancel your membership then you cannot sign up for a new account for six months. The last thing to watch out for is that you have to notify AMC at least five business days in advance of your billing day in order to cancel your membership without being charged for another month of service. In our opinion, A-List provides the best value when it comes to the number of movies you can get with your subscription fee. You’re paying roughly $1.60 per movie for 12 movies, whereas MoviePass’s subscription fee averages out to about $3.33 for each of the three movies you get. Per-movie value aside, A-List is the clear winner when it comes to all the perks and features you get with the membership. It is the only one in the chart that gives you access to 3D movies, advanced purchases via website or phone and phone support. When it comes to the perks you get at the theater, A-List, in our opinion, wins out again. MoviePass and Sinemia don’t offer those perks because they aren’t tied to any single theater chain. Cinemark’s Movie Club members get 20% discounts at the concession stand but they don’t have priority lines for the members like A-List does. In our opinion, A-List offers the most bang for the buck because you get more movies per month than the other services and you also get bonus cash, concession discounts and priority lines at the box office and the concession stand. Based on our research of this service and three others, we believe that A-List's strengths are the number of movies you can get every month as well as member-dedicated ticket and concession lines. While the 10% bonus cash you get isn’t quite as lucrative as Cinemark’s 20%, the $5 bonuses you get for every $50 spent balances the bonuses out. Another huge bonus is that you can watch premium format movies with your weekly movie allotment, something that only Sinemia offers for one out of their three monthly movies. The downside to the subscription is that it costs more than the competition. However, for avid moviegoers, we don’t think this is going to be a problem because you'll most likely go to the movies at least four times a month, which is already more than what you get with MoviePass, Sinemia and Cinemark Movie Club. In general, we think A-List offers excellent value for moviegoers who have a habit of heading to the theater at least four times a month and like to get concessions to go with their movie. The free upgrades, bonus cash and dedicated A-List lines will most likely appeal to this type of person. I pay for your movie pass, please don't charge me to see a movie and then not want to give me a refund or concession credit. Both me and my husband are AMC Stubs members. We pay $19.95 each per month. As I was looking over our bank statements, I noticed a charge of $13.24 that was taken out of our account on 1/27/19. I called and spoke with a customer service agent and explained to her the above. She was able to look up what movie it was that I was charged for. I asked for a refund as we are Stubs members and should not have been charged. She spoke to her manager and said that her manager said that they would not be able to give a refund. I asked if they could at least put that amount on my Stubs card for us to use at the concession stand, she placed me on hold again and said that her manager said no. I asked for her name and her manager's name and she said that she could not give me her manager's name? I asked to speak to her manager and have now been on on the call for 32 minutes for what I thought should be a quick fix. AMC, please fix this wrong. I should not be charged for something I am already paying for. I joined A-List when it first started last summer. In January I lost my Wells Fargo credit card. Wells Fargo sent me a new card within about a week and it had a new number on the front and a new 3-digit pin number on the back. I called my creditors who had my card on file for monthly payments and AMC A-List was one of them. While most creditors are more than happy to update your credit card information, AMC/Stubs does not provide you with an easy way to do that. More problematic is the fact that the agents who answer the phone do not know what to do to update your account either. After about three tries, I did get an agent on the line who told me that my account had been canceled and that if I wanted to start a new account it would cost me an additional $4.00 per month or an additional $48.00 per year. That's right, $48.00 per year because I lost my credit card. Sounds pretty slimy to me and if not illegal, at least immoral. So if that is how AMC is going to treat early adopters, then I will take my Senior Citizen dollars elsewhere and try one of the other services that other theaters are now using in our area. Write a Review for AMC Stubs A-List!